The law firm representing the Democratic National Convention host committee in its effort to keep its donors secret until after this week’s event is the firm that has long employed the host committee’s chairman Ed Rendell. Rendell, the former Pennsylvania governor, Philadelphia mayor, and active Hillary Clinton surrogate, is the chairman of the host committee, which is now under fire for keeping its donor list secret even though a Pennsylvania agency has ordered it to be released. The law firm fighting in court on the host committee’s behalf is Ballard Spahr, where Rendell is currently employed as a special counsel. Ballard Spahr attorney David Pittinsky, a partner at the firm, has argued that releasing the committee’s donor list would hurt its ongoing fundraising activity. The firm is required to provide financial reports to Philadelphia due to a $15 million line of credit it received from the city in case it falls short of its fundraising goals. The firm is doing the legal work as an in-kind contribution to the host committee. Rendell has a long history with Ballard Spahr. Rendell first joined the firm following his eight-year stint as Philadelphia mayor, joining on as a partner on the exact day his term was finished in January 2000. Rendell was chairman of the Democratic National Committee at the time, and in his first year as a partner at Ballard Spahr, the firm gave more than $700,000 to the party organ. When he decided to run for governor in 2002, Rendell pledged to voters that he would not return to Ballard Spahr if he was elected. 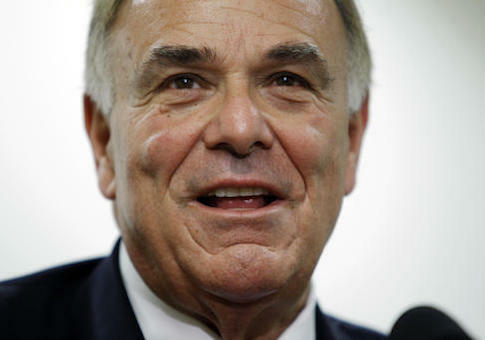 "It’s just a wonderful law firm and to not return to it would be hard for me," Rendell said. "But I think it is wrong for a governor to sever connections from a firm, be governor, apply the law, and then go back to that firm." In 2011, less than a week after his eight years as governor, he went back on that pledge and signed on as a partner at Ballard Spahr. Ballard Spahr has contributed more to Democrats than Republicans in past years, and this election cycle has been no exception. So far this cycle, no candidate has received more money from the firm than Hillary Clinton. Second behind Clinton is Katie McGinty, the Democratic Senate candidate in Pennsylvania, who has Rendell working as her campaign chairman. The committee’s push for secrecy has been slammed by critics who point to language in a draft of the Democratic Party platform that says "we need to end secret, unaccountable money in politics by requiring, through executive order or legislation, significantly more disclosure and transparency," coupled with promises by Clinton throughout her campaign for transparency. "This is hilarious given that Democrats and their progressive allies have spent years demanding donor disclosure so they can intimidate conservatives from engaging in political speech," the Wall Street Journal editorial board wrote last week. "Put this one in the file for Democrats and double standards." Rendell did not respond to a message sent to his Ballard Spahr email address asking whether he facilitated the in-kind work that his firm is doing for the DNC host committee and whether or not he thinks it benefits the firm. Rendell has been criticized in recent days for awarding a contract to a company owned by his son for a cell phone app for those participating in a "Donkeys Around Town" scavenger hunt to find 57 fiberglass donkeys that were set up around the city. The convention website says that Rendell "conceived" the idea for the donkey scavenger hunt. Rendell’s son would not disclose to the Philadelphia Inquirer how much money the DNC agreed to pay his company, but he did say that he was "hopeful [the contract] will help us break into the tourism market." This entry was posted in Politics and tagged 2016 Election, Democratic Donors, Democratic Party, DNC, Ed Rendell. Bookmark the permalink.